The BCW Gloss Supreme is a pearl white topcoated polyester thermal transfer facestock with permanent acrylic adhesive. Ideal for thermal transfer applications that require outstanding print quality and unparalleled smear and scratch resistance. Recommended for use in a wide variety of applications, including shelf or pallet labels, or labels in contact with moving parts. 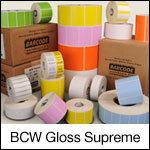 Equivalent to Zebra's Z-Ultimate labels.Use with BCW Resin ribbon. 1.50" x 0.50" gloss polyester thermal transfer label on a 3" x 8" core. 7700 labels per roll / 4 rolls per case. BCW Gloss Supreme 2371400 special features - Perforated. Use with resin ribbon. 1.50" x 1.00" gloss polyester thermal transfer label on a 3" x 8" core. 4300 labels per roll / 4 rolls per case. BCW Gloss Supreme 2371450 special features - Perforated. Use with resin ribbon. 2.00" x 0.50" gloss polyester thermal transfer label on a 3" x 8" core. 7700 labels per roll / 4 rolls per case. BCW Gloss Supreme 2372050 special features - Perforated. Use with resin ribbon. 2.00" x 1.00" gloss polyester thermal transfer label on a 3" x 8" core. 4300 labels per roll / 4 rolls per case. BCW Gloss Supreme 2372100 special features - Perforated. Use with resin ribbon. 2.00" x 1.25" gloss polyester thermal transfer label on a 3" x 8" core. 3500 labels per roll / 4 rolls per case. BCW Gloss Supreme 2372125 special features - Perforated. Use with resin ribbon. 2.00" x 2.00" gloss polyester thermal transfer label on a 3" x 8" core. 2300 labels per roll / 4 rolls per case. BCW Gloss Supreme 2372200 special features - Perforated. Use with resin ribbon. 2.25" x 1.25" gloss polyester thermal transfer label on a 3" x 8" core. 3500 labels per roll / 4 rolls per case. BCW Gloss Supreme 2373125 special features - Perforated. Use with resin ribbon. 2.75" x 1.25" gloss polyester thermal transfer label on a 3" x 8" core. 3500 labels per roll / 4 rolls per case. BCW Gloss Supreme 2374125 special features - Perforated. Use with resin ribbon. 3.00" x 1.00" gloss polyester thermal transfer label on a 3" x 8" core. 4300 labels per roll / 4 rolls per case. BCW Gloss Supreme 2375100 special features - Perforated. Use with resin ribbon. 3.00" x 2.00" gloss polyester thermal transfer label on a 3" x 8" core. 2300 labels per roll / 4 rolls per case. BCW Gloss Supreme 2375200 special features - Perforated. Use with resin ribbon. 3.50" x 1.00" gloss polyester thermal transfer label on a 3" x 8" core. 4300 labels per roll / 4 rolls per case. BCW Gloss Supreme 2376100 special features - Perforated. Use with resin ribbon. 4.00" x 2.00" gloss polyester thermal transfer label on a 3" x 8" core. 2300 labels per roll / 4 rolls per case. BCW Gloss Supreme 2377200 special features - Perforated. Use with resin ribbon.